ary Adcock, a pioneer in advanced HD post-production workflows and founder of consulting firm Studio 37, has incorporated the Sonnet Fusion™ R400Q [now Fusion R400QR5] rackmount four-drive SATA storage system into a mobile solution that supports flexible, secure storage of all digital content within a tapeless production environment. Designed in cooperation with Fletcher Chicago, one of the largest HD equipment rental houses in the U.S., the Fletcher Digital Management System (DMS) provides users with a convenient and reliable means of storing and backing up content while on set for commercial production and feature film projects. The 1U Sonnet system, equipped with four Enterprise/RAID drives, has been built into a flight case along with a multicard Panasonic P2 solid-state card reader, a CF reader for RED ONE® and still image content, and an AJA® Io HD unit for onset capture and playback. The DMS Cart can be shipped anywhere, and once the unit is powered up, the user can capture content live and in real time from any SD or HD camera system via the Io HD to the Fusion system’s four SATA drives, which are configured as two RAID 1 volumes and mirrored for complete redundancy. With 4TB total capacity and 2TB aggregate, the Sonnet system maintains the original data and additional duplicates, thus providing the backup required for high-end production. Data captured or transferred onto the Fusion R400Q is automatically copied to the unit’s second volume, and this action in turn triggers an FTP to an attached Quantum SDLT 600A drive to provide an LTO data tape backup. 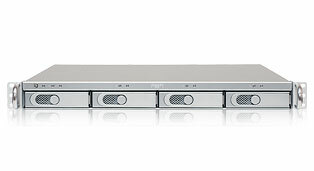 The Fusion R400Q combines the versatility of hot-swap functionality with the convenience of a quad interface (eSATA, FireWire® 800, FireWire 400, and USB 2.0). This Sonnet SATA storage system employs a high-performance SATA II port multiplier to manage the enclosed drives, regardless of the interface. Connected with a single locking eSATA cable to a 4-port Sonnet Tempo™ SATA host controller installed in a Mac® or Windows® computer, an R400Q system provides performance without compromise, with the potential to increase performance further by ganging additional R400Qs on the same card. For added flexibility, users can instead connect the R400Q to virtually any computer through a single FireWire or USB cable. The system’s drive trays have built-in levers that double as handles to make swapping drives easy, while the cable-less connections from drives to enclosure simplify setup and assure reliability over the long haul. With its powerful built-in universal power supply and compact dimensions, the Fusion R400Q is ideal for any application requiring the storage of large amounts of data in a small package. To learn more about Gary Adcock, visit www.studio37.com. 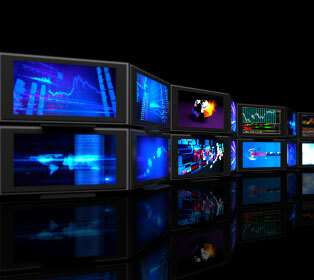 The world is moving away from tape and film in the acquisition process at the highest level of HD and film production. The move of major camera manufacturers to tapeless acquisition presents newe challenges in managing content during production. In some cases, multiple terabytes of data are being captured each day, and every bit of that content must be guaranteed. Our DMS system provides that insurance and allows the production team to focus on their creative work rather than data management. With its compact design, single eSATA connection, and RAID capability, the Sonnet Fusion R400Q is the simplest and most elegant solution for building a portable cart.